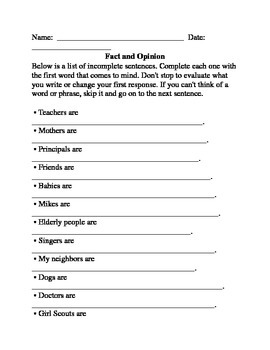 Students are provided with 14 sentence begins (ex: Teachers are ___; Mothers are ___). Students are to write down the first word that comes to mind. After completing the sentences, students are determine which sentences are fact and which are opinion and discuss how they know. Students will think about how we form out biases.